Let a, b two conics and consider the family I(a,b) of conics a', b', ... they generate. 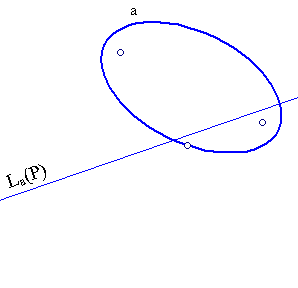 For a point P the polar lines a'(P), b'(P), ... with respect to the various family members, pass all through a second point Q. The quadratic transformation is the map F : P --> Q. 1) For an arbitrary point P consider the two polars La(P), Lb(P) of P with respect to (a) and (b). 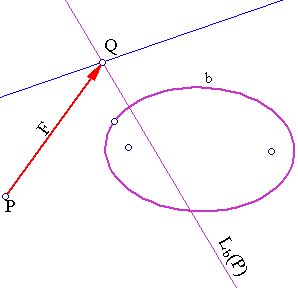 2) Define Q as the intersection point of the two lines La(P), Lb(P). xtAs,tx = 0, where As,t = sA1 + tA2. F(x) = A2-1(xt x (xtA1A2-1). This is a homogeneous quadratic function in the coordinates (x1,x2,x2) whence the name. The transformation is well defined everywhere except the points x for which xt x (xtA1B2) = 0 i.e. the x's which are collinear with xtA1B2, or equivalently the eigenvectors of A1B2, or equivalently the x's for which the two polars with respect to (a) and (b) coincide. Obviously, the image c = F(L) of a line L under a quadratic transformation is a conic and introducing projective coordinates on line L we obtain, through the quadratic transformation, a rational representation of the corresponding conic c.
In the generic case, in which A1B2 has three different real eigenvalues, the corresponding three eigenvectors v1, v2, v3 represent three points of the projective plane through which pass all the image-conics c = F(L) of lines under the corresponding quadratic transformation. In fact, in that case consider the polar Li corresponding to vi (with respect to any conic-member, since all are the same). Consider also the intersection point u of an arbitrary line L with Li. The polar of u with respect to (a) will pass through vi (reciprocity of polars). The same argument shows that the polar of u with respect to (b) will pass through vi. Hence vi = F(u). The reciprocity of pole-polar implies that if Q = F(P) then P = F(Q) i.e. F is involutive, its inverse coinciding with itself. By Desargues involution theorem, the conics of the family I(a,b) define on line PQ (with Q = F(P)) through their intersection points an involution. P, Q are the fixed points of this involution, since they are conjugate with respect to every member of the family. Consequently the members of the family passing through P, Q are tangent there to the line PQ. For a continuation of this subject look at the file Quadratic_Transformation2.html .